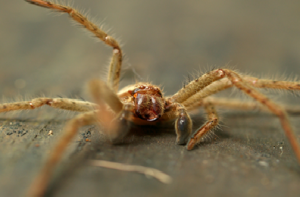 Australia has some of the most dangerous spiders in the world; it’s not surprising how often when we encounter a spider scuttling across the floor. Many people suffer from arachnophobia too. Spiders encountered around your home and garden seek shelter and food, most spiders prefer dark areas for security and privacy, they will be drawn to certain areas depending on the species of spiders, they have different ways of capturing their food and looking after their young. Many an insect search for a feast, so if you have insects then spiders will be on the lookout for that next feast. You may not see the spiders, but you will certainly notice their webbing in certain parts of your home like e.g. 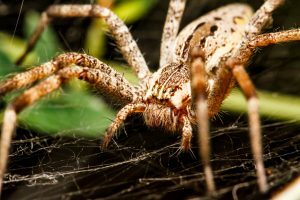 your garden, eves and under window sill, patios areas, outside furniture, depending on the spider some prefer dry environments and others like damp conditions. 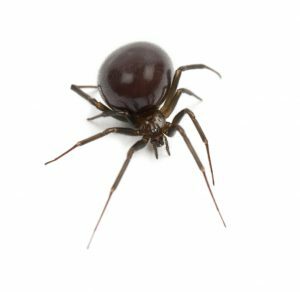 Spiders at your home or workplace may be a concern to your family or workers, you can call one our friendly operators will arrange for one of our Spider Technicians to give you advice for your spider solution. Keeping your home neat, tidy and free of dust and cob-webs will ensure that there are no spiders in your home regular vacuuming, dusting, and de-cluttering will help to eliminate spiders from entering in to your home or workplace. The less amount of food for the spiders means that they are not interested in staying in your home and would look for some other habitat. keep spiders out of your home is to never let them in in the first place! Keep the yard free of leaves, grass clippings, wood piles, or any other notorious spider hangouts. Spiders love to hide in vegetation and under rocks, wood piles, in compost, etc. but when it gets cooler they might well try to move inside. Huntsman spiders are large, flattened and hairy, long-legged spiders. They are mostly grey to brown, sometimes with banded legs, extremely fast moving as many people have seen in their own home. Their rear two legs are shorter than first two pair of legs which are longer and span out sideways, enabling to walk forwards and sideways often giving them a crab-like appearance. Some species are very large reaching over 160 mm in leg span. Huntsman spiders occur Australia-wide and are usually found on tree trunks, under bark, beneath stones or on the walls of houses. Some species are extremely compressed and live between the hairline cracks of sandstone and granite outcrops. Bites may be painful but not toxic. 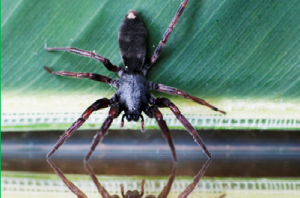 White-Tailed Spider is long and has a cigar-shaped body, dark grey with a white spot at the tip. They prefer cool dark areas such as under bark, leaf litter, rocks around the garden. 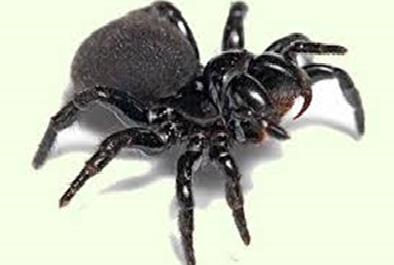 They are stalker of other spiders; the black house spider is one of the favorite foods. The female white-tail lays around 80-100 pink eggs in a silk sack and guards the ‘nest’ until the spiderlings emerge. On hatching, the little spiders disperse to find their first meal. Bites cause local pain and blistering, also tissue necrosis. Mouse spiders are found in east coastal and highland regions of Australia and are sometimes mistaken for funnel-web spiders. Females are black overall and are larger than the males. The males are black with a bluish-white patch on the front of their abdomen. Like trapdoor spiders, the mouse spider lives in burrows in the ground, often in the banks of rivers, creeks and other waterways, but is also found in suburban gardens. The burrows are built with double or single trapdoors and the entrance is oval shaped. The females tend to remain in or near their burrows throughout their lives. Males can be found wandering during early winter, especially after rain. Insects are the main prey of mouse spiders, but their diet could possibly include small vertebrates and other spiders. Males reach sexually maturity at about 4 years of age. They leave their burrows during the breeding season to find a mate. They go looking for a female during the day and the mating usually takes place in the female’s burrow. Mouse spiders should be considered extremely dangerous and treated with caution as they can be aggressive and deliver a painful and toxic bite if provoked. The female red-back is black with a distinctive red or orange marking on its back, although this may sometimes be absent. These markings may be broken into spots in front and, sometimes, thin white lines may be visible. The male is short-lived and has more complex markings than those of the female, incorporating white and sometimes yellow markings. 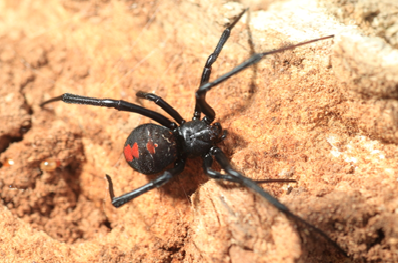 Red-back spiders can be commonly found in logs or under rocks, patio furniture, children’s play things, in the bush as they tend to reside in dark, dry areas. In suburban regions, the red-back has been known to live under roof eaves, floorboards, shelves, flower pots or in garden sheds. The web is a tangle of dry silk. The traplines are sticky to assist with catching their prey. 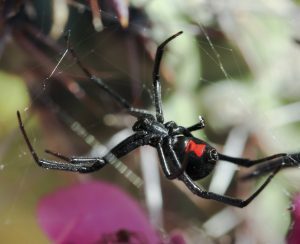 Red-backs eat almost any small insects that are caught in their webs. They will also eat skinks and even juvenile mice, snakes and frogs. Red-back spiderlings will also eat their siblings. The red-back spider weaves a snare-like structure that traps prey walking on the ground beneath the web. Its spring-like action traps the animal into the small web above, where it cannot escape from the traplines that are covered with sticky globules. Bites from the female only, very painful and toxic. There are many different species of wolf spider, which are so named because they actively hunt and run down their prey. Most species are dark brown or grey in colour with black, grey, orange or brown markings. Wolf spiders have three rows of eyes – the top row of two are medium sized, the middle row consists of two large eyes and below is a row of four smaller ones. These provide the spider with exceptionally good eyesight for spotting and catching its prey. Its body is relatively hairy, and the legs are long. The male can reach up to 20mm long and the female up to 35mm. Wolf spiders occupy a huge range of habitats, including open woodlands, grasslands, gardens, and bush. The male wolf spider attracts the female by waving its pedipalps and front legs in the air. As long as these signals are carried out in the right fashion, the female does not regard the male as being the next potential meal. After mating, the female produces a silk mat into which she deposits around 100 eggs. After hatching, the babies crawl onto the mother’s back and remain there until their fat reserves have been used up and they need to start finding their own food, which may take several months. Bites may be painful, some could be toxic. The St Andrew’s Cross spider commonly builds its web amongst shrubs and other vegetation or against walls of buildings. It normally hangs upside down in the web with two paired legs placed along each arm of the cross. 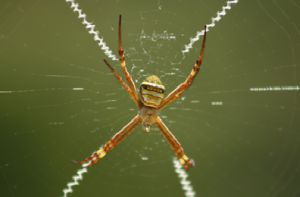 The silken cross may be used for strengthening the web, for camouflage or for enhancing prey catches. It has been shown that the cross reflects ultra-violet light which is particularly attractive to insects. Male’s spiders cephalothorax and legs brown; abdomen cream with a mottled brown pattern. Female’s cephalothorax brown and covered with silky hairs. Abdomen with horizontal stripes of yellow and crimson brown, sometimes with pale spots on the brown stripes. Legs dark brown to black with a few yellowish bands. 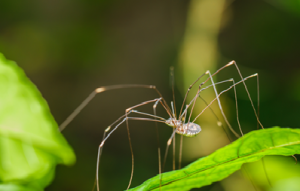 Small-bodied with relatively long legs; often appears to have only four legs due to resting position in web. Egg sacs are pear-shaped, green in colour and are suspended in nearby vegetation rather than in the web itself. The bite of this spider is considered harmless, non toxic. The Daddy Long Legs spider is commonly found indoors in dark areas, such as behind doors or furniture, disused rooms, garages, outside sheds, subfloors. Lifespan may vary from three months to two years depending on temperature and food supply. They feed on small insects, spiders, silverfish. Overall body colour pale brown to cream with darker markings on legs and cephalothorax, sometimes with darker markings on abdomen. Recognised by its extremely long and slender legs and relatively small body, male 16mm and female 20mm in body length. Makes a tangled web, up to 30 cm in diameter, inside shelter locations. The Black House Spider is found in holes in tree trunks, rockery on the corners of window frames and doors, in crevices of brickwork, under eaves. The black house spider is a timid spider and will normally only venture from its retreat when prey is entangled in the web. Robust, hairy spider with a typically blunt, square front end of the cephalothorax. Black to grey abdomen with, cephalothorax and legs shiny black, male slightly paler, male 10mm and female20mm in body length. The prey is then quickly seized and dragged back into the tube. Males wander at night during the mating period. After mating the female lays her silk-encased eggs within the tube. The maximum life span is around two years. Because of its timid nature this spider rarely bites humans; however, the bite can cause general symptoms including nausea, sweating, localised pain and swelling.